Minnesota Adventure Co offers guided kayak tours in both Saint Paul and Minneapolis. Explore the history of Fort Snelling and enjoy amazing views of the Saint Paul skyline on our Mississippi River tour, or twist and turn your way through South Minneapolis on the beautiful Minnehaha Creek tour. Groups up to 15 are welcome, kids under 10 paddle for free, and MNAC will provide you with kayaks, transportation, and ACA certified guides. What better way to spend your summer than on the water! Visit our web page to book your tour today. 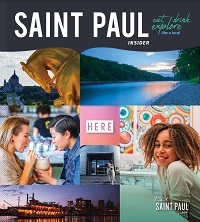 Did you know Saint Paul has more shoreline than any other city along the entire Mississippi River? Take advantage of all that riverfront with these activities.